An issue for those authors choosing to "self-publish," a relatively new phenomenon in the world of books and writing, is whether or not the "book," when finished, will continue to exist in the form in which it was first published, or whether the "book" will change, on a copy per copy basis. 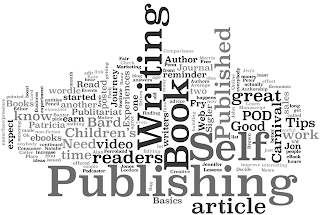 Since it is now possible to produce the physical book on a print-on-demand basis, and since it is relatively easy to modify the "contents" of a book, always under the same title, at any time, a self-publishing author can decide whether to deliver readers the latest iteration of the author's thoughts, or that version of the author's thoughts that existed at the time the book was first made available through publication. In real life, time does not stand still, and the world we create is continually updated, for better or for worse. My self-published books are still BOOKS, with a cover on either side and pages in betwen, whereupon I write words. So far, I'm resisting the temptation ot update editions of esays and fiction. My non-fiction, however, constantly evolves. I don't know what to think of eBooks, yet. I can't grasp the concept of an electronic reader as anything but a marketing ploy.